I share a lot of smoothie recipes on this site. However, I have never shared a healthy dessert smoothie. That is until now. 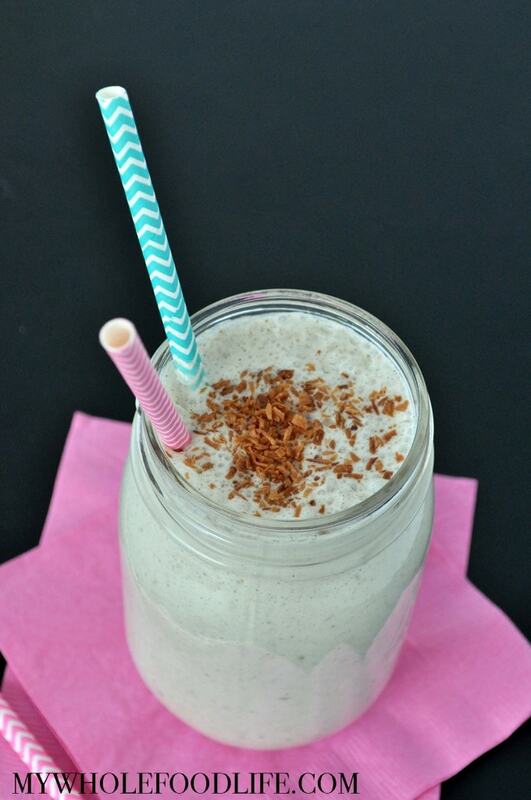 Today I am sharing this delish and decadent Toasted Coconut Vanilla Smoothie. Toasted coconut automatically makes everything better in my opinion! This indulgent smoothie recipe makes the perfect sweet treat. If you also like toasted coconut, you may also want to try my flourless toasted coconut cookies. This recipe makes 2 servings, so you can half it for a single serving. This dessert smoothie is vegan, gluten free and paleo friendly. It also contains zero processed sugar. I used dates to sweeten this. The toasted coconut and banana also adds a nice sweet flavor. Full of coconut flavor, this smoothie is a must try for coconut lovers! Spread the shredded coconut on a lined baking sheet and place in the oven for 3-5 minutes. You just want to toast it a little to bring out the flavor more. Set aside. Open the can of coconut milk and scoop out the fatty part. Place it in the blender . You can freeze the remaining water to use in smoothies. If I do not have vanilla beans..how much natural vanilla extract do I use in the beans place? Wow... this smoothie looks so amazing and decadent! Perfect for a desert!!! I really want to go out and get a can of coconut milk now! This is amazing! My boys love it and said it tastes like ice cream :) i followed the recipe except for the vanilla bean. I used 1/2 tsp of vanilla extract. Will definitely make again! Lovely! What do you use the left over coconut milk for? I just put this into my Fitness Pal app...does it really come to 696 calories per serving?? ?